Nutrients and light are key environmental factors that can determine biomass yield and productivity of an aquaculture system. Light is mainly controlled by the choice of the aquacultural site. Nutrients are controlled on the site and nutrient manipulations can control biomass yield, productivity, epiphytes and the amount of certain products formed. Carbon, nitrogen and phosphorus are the main three nutrient elements added to large scale aquaculture systems. This review focuses mainly on nitrogen and the nitrogen physiology of seaweeds. Important concepts such as nutrient uptake, assimilation, storage, response to nutrient additions, nutrient ratios, and critical tissue nitrogen levels are discussed in terms of their application to aquaculture. For a particular species grown in an aquaculture system, it is important to know the C:N:P ratio of the seaweed under nutrient saturating conditions. This information will make the delivery of C, N, and P more economical. Nutrient uptake rates vary considerably with various physical, chemical and biological factors. In particular, light and temperature influence nutrient uptake rates, but we require further research to fully understand their effects. 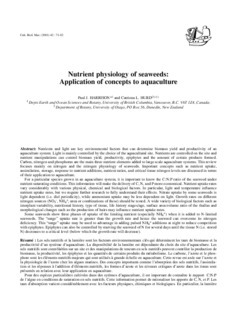 Nitrate uptake by some seaweeds is light dependent (i.e. diel periodicity), while ammonium uptake may be less dependent on light. Growth rates on different nitrogen sources (NO3-, NH4+, urea or combinations of these) should be tested. A wide variety of biological factors such as interplant variability, nutritional history, type of tissue, life history stages/age, surface area:volume ratio of the thallus and morphological changes such as the production of hairs may influence nutrient uptake rates. Some seaweeds show three phases of uptake of the limiting nutrient (especially NH4+) when it is added to N-limited seaweeds. The "surge" uptake rate is greater than the growth rate and hence the seaweed can overcome its nitrogen deficiency. This "surge" uptake may be used to advantage in adding pulsed NH4+ additions at night to reduce competition with epiphytes. Epiphytes can also be controlled by starving the seaweed of N for several days until the tissue N (i.e. stored N) decreases to a critical level (below which the growth rate will decrease).